If you've ever had a bout of poison ivy or a serious sunburn, you know just how irritating and itchy your skin can be. You also know the immense relief Aloe Vera can bring. 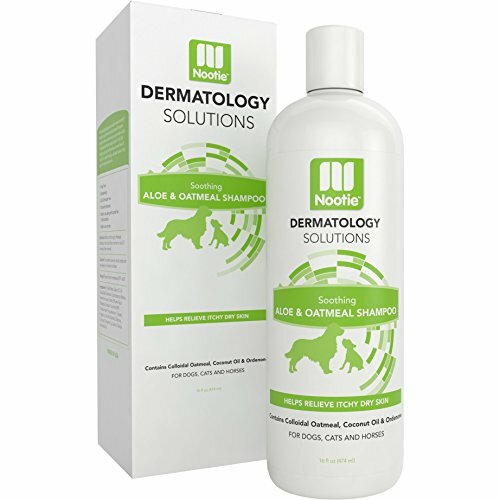 Give your pet the same relief with Oatmeal Aloe Vera Pet Shampoo from Nootie. Our non-soap formula promises to bring your pet relief on contact without the need for harsh chemicals that can cause more problems than they solve. Plus, the deodorizing effects of Ordenone combined with Oatmeal and Coconut Oil create a nice, mellow fragrance that won't overpower your pet's sensitive nose. Lather, Rinse, Relieve: Relief from your pet's constant itching is just minutes away. Simply wet your pet's coat thoroughly, lather up and massage the shampoo into the coat, then rinse thoroughly. The Aloe will go to work right away, and you should see a vast improvement in behavior. No Strong Odor: Dogs in particular don't like it when all of a sudden they don't smell like themselves. That's why we used gentle fragrances combined with a deodorizer to impart a subtle, clean fragrance that won't irritate your furry friend. Manufactured With Care: We decided to manufacture our products here in America rather than overseas. This costs a little more up front but results in a higher quality product far less prone to defects and harmful substitutions. From where your pet is sitting, this means the same soothing feeling after every application of our premium, non-medicated shampoo. Pet-Pleasing Guarantee: Test our claims; try this anti-itching shampoo for yourself. If you don't think your pet is receiving the relief he deserves, simply return the unused portion for a full refund. Say Goodbye To Constant Itching and Discomfort; Order Your Pet Some Relief Today! ● DEODORIZE WITH COLLOIDAL OATMEAL COMBO: We include a rejuvenating combination of Coconut Oil, Colloidal Oatmeal and Ordenone which creates a pleasant, mellow fragrance agreeable to both you and your pet. Meanwhile, the Aloe Vera gel rushes itchy skin relief to where it's needed most. ● PET-PLEASING GUARANTEE: If this itchy dog shampoo doesn't calm your pet and bring well-deserved relief from the constant itching, simply return the unused portion for a full refund. Add a bottle of our Oatmeal Aloe Vera Pet Shampoo to your cart today; you'll feel the gratitude right away!